Using the “Send E-mail PowerShell script” for automation purposes such as sending a daily report. 2. Authenticated SMTP or TLS session. In the current article, we will review the method which can be disrobed as – Anonymous SMTP mail session. 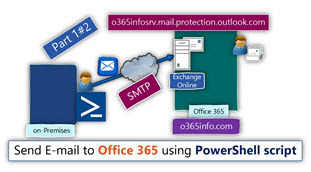 Before starting with the exact instruction about how to create the required “Send E-mail PowerShell script” let’s briefly review the method in which client can address the Office 365 mail services. 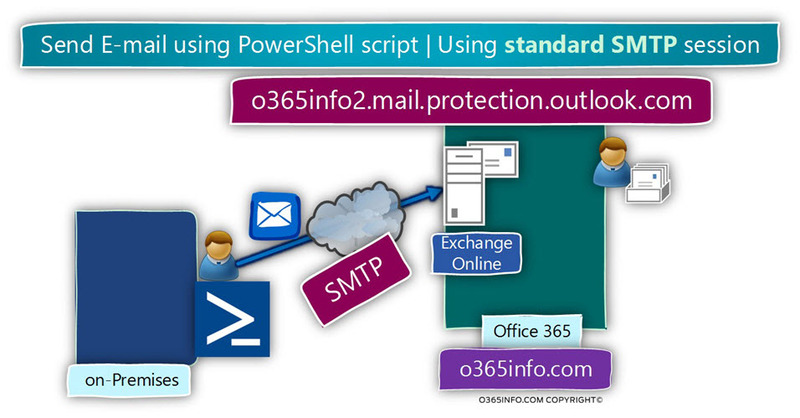 A method, in which we the PowerShell script addresses the Office 365 mail server using SMTP session (non-encrypted session). The SMTP session is created using an Anonymous connection. The meaning of ” Anonymous connection ” is that the side that addresses the Office 365 mail server (the PowerShell script), doesn’t provide any user credentials. The main benefit of this method is that we are avoiding from the procedure of providing user credentials. The need for providing credential is “blinded” to other tasks such as the need for securing the credentials and so on. The main disadvantages of using Anonymous connection are that the mail server cannot trust the sender because the sender appears anonymous. 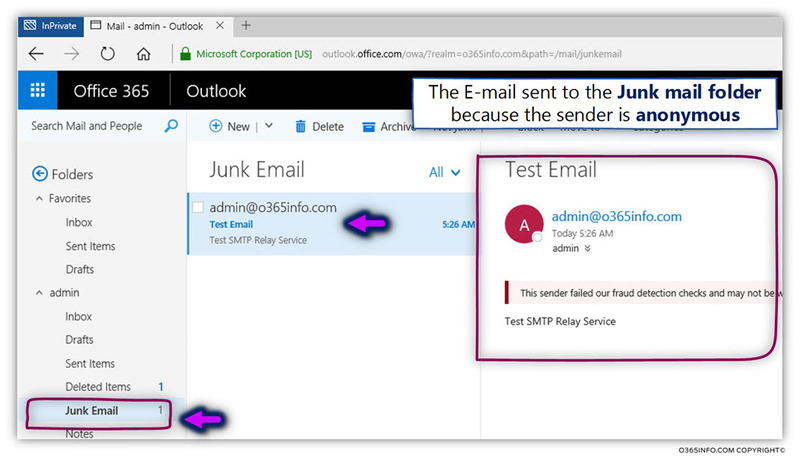 Most of the time, the E-mail that will be sent by the PowerShell script will Identify as Spoof email because – the Office 365 recipient E-mail address that we use as the “sender address” is not authenticated. Addition disadvantages are, that when using “anonymous session,” we cannot send E-mail to “external recipient” meaning, recipients whom their E-mail address is not hosted by the Exchange Online server which hosts our domain. The solution for this problem can be implemented by creating Exchange Online incoming mail connector or define ten E-mail addresses of the sender in the whitelist of allowed senders. A method, in which the PowerShell script addresses the Office 365 mail server, using TLS session (encrypted session) + providing user credentials (authenticated session). Securing the communication channel – when using TLS protocol, the communication channel between the host who sends the E-mail and the Office 365 mail server is encrypted. Authenticated session – the main advantage of this method is that when we provide the Office 365 recipient credentials, the Exchange Online relates to the “sender” as a trusted sender. For this reason, we don’t need to add an additional configuration setting on the Exchange Online server side and also, we can send the E-mail to external recipients who are not hosted on the Exchange Online server. In case that we want to use “Send E-mail PowerShell script” as a scheduled task, we will need to find a solution in which the PowerShell script can access the required credentials that store in a file. Keeping user credentials such as a password in a not secured format is bad practice! Although we can add the password to a non-protected text file (the PowerShell file), this option is not recommended. The solution for this “security needs,” will be implemented by a method, in which we create an encrypted password file, and instruct the “Send mail PowerShell script” to access the encrypted file and fetch the required password from this file. The procedure in which we need to encrypt the credentials, consider as more complicated versus the scenario in which we use SMTP session without credentials. In this section, we review how to create a “Send E-mail PowerShell script,” that will address the Office 365 as a -mail server. In this scenario, we will create a standard SMTP session, and we will not provide any user credentials (anonymous connection). 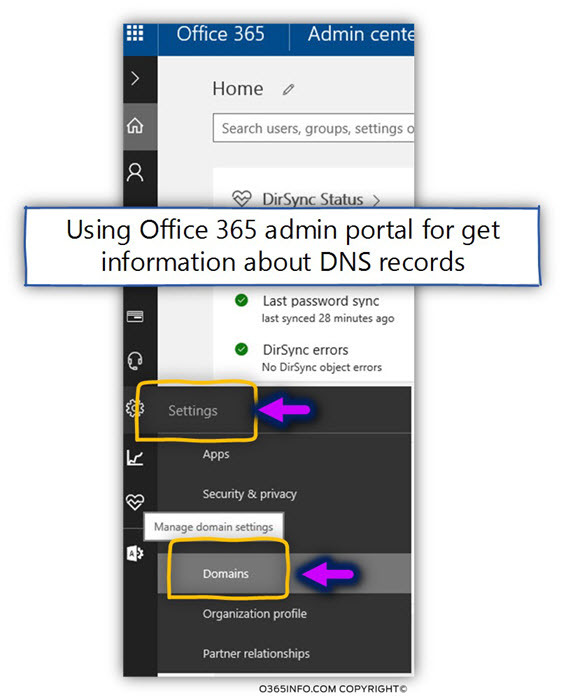 We will need to “fetch” the information about the Exchange Online host name meaning, the MX record that represents your public domain name in Office 365 from the Office 365 portal | DNS settings. Create a PowerShell script, that will include the required parameters such as the sender E-mail address, the recipient E-mail address, the mail server name, the mail server port number, the user credentials, etc. In case that we didn’t use in the past the existing PowerShell console for running PowerShell script, we will need to configure the PowerShell console to “allow” PowerShell script execution. In the Office 365 environment, if we want to use a non-authenticated session with Office 365 mail server, we will need to locate the host name of the Exchange Online that represents our public register domain in Office 365. Note – we will review how to get the information about the Exchange Online host name in the next section. 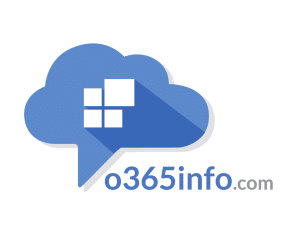 To be able to get the hostname of the Office 365 mail server that represents our public domain name, we will use the Office 365 management portal. In our scenario, we will select to view the setting of the domain name – o365info.com by double-click on the selected domain name. In the following screenshot, we can see the DNS setting of the o365info.com domain. We will copy the information about the hostname who appears in the MX record. To create the PowerShell script, we can use any text editor. In our example, we use the notepad. From (number 1) – we will use the E-mail address – [email protected] for representing the sender E-mail address. To (number 2) – we will use the E-mail address – [email protected] for representing the destination recipient E-mail address. Port (number 6) – this is the port number of the mail server that will “listen” to our communication requests. In the Office 365 environment, the Exchange Online will listen using port 25. By default, the PowerShell console will prevent us from running the PowerShell script. 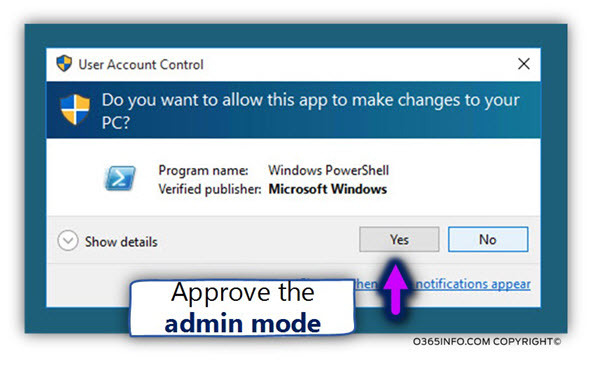 To be able to run the PowerShell script, we will need to set the default PowerShell exaction policy. 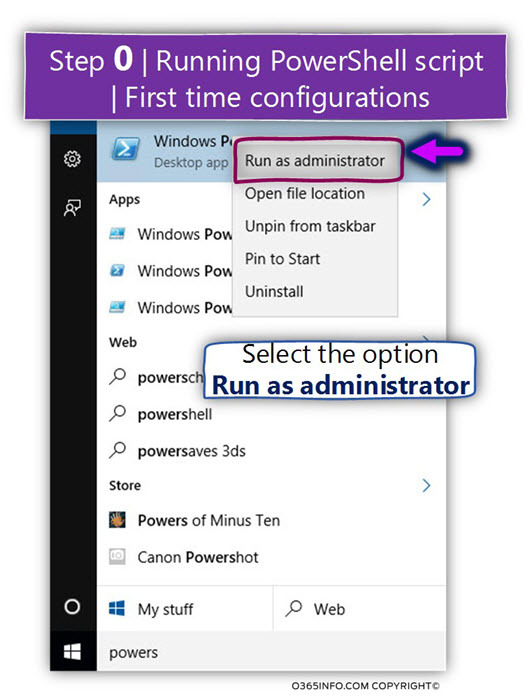 To be able to update the existing PowerShell exaction policy, we need to run the PowerShell console as Administrator. In our scenario, the PowerShell script saves in the C:\script folder. script – Sendmail-smtp.ps1 or use the PowerShell autocomplete feature. After “hitting” the TAB key, The PowerShell consoles, we complete the rest of the PowerShell script name by himself. This is an expected result because as mentioned, the PowerShell script uses the identity of Office 365 recipient ([email protected]). Because the PowerShell script didn’t provide any user credentials, Exchange Online considers the E-mail message as a ” suspicious E-mail” and for this, reason stamps the E-mail as Junk! If you want to avoid this scenario, it’s recommended to create an Exchange Online Connector which will identify the “source sender” by his public IP address. Do you have any vіdeo of that? I’d love t᧐ find out some additional information.